Comments: Leaves of some selections of Kong coleus are large enough to cover ones face. They will not take full sun, but will thrive in light or filtered shade and in shade. 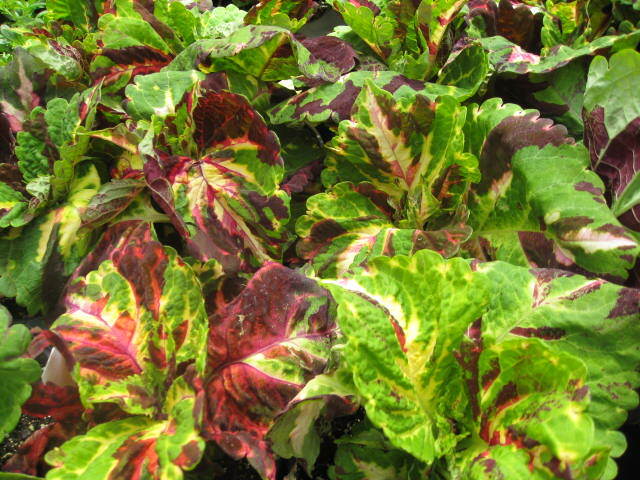 In addition to the green in the leaves, they are available with red, rose-red, scarlet and a moasic color. May live over where there are no forst, but are at their best during their first year of growth. Even then, they should be cut back when they become tall and gangly as they will produce nice new growth. Pinch off the flower shoots as soon as you see them, as they are not grown for these. They are susceptible to mealy bud and aphids.